2011-10-05 NEW • Distribution Release: Salix OS 13.37 "Ratpoison"
Rate this project George Vlahavas has announced the release of Salix OS 13.37 "Ratpoison" edition, a Slackware-based distribution showcasing the rather unusual Ratpoison window manager: "Salix Ratpoison 13.37 is released. This is probably the first-ever Linux distribution release featuring Ratpoison as the main window manager. The aim of the Ratpoison edition is to create a system that is fully usable with the keyboard only, no mouse required! For everyone that is not familiar with Ratpoison, Ratpoison is a window manager for X 'with no-fat library dependencies, no fancy graphics, no window decorations, and no rodent dependence'. Ratpoison uses a workflow that is similar to that of GNU screen, which is very popular in the terminal world. All interaction with the window manager is done through keystrokes." See the complete release announcement which includes hints on using Ratpoison and a link to a start-up guide. Download: salix-ratpoison-13.37.iso (426MB, torrent), salix64-ratpoison-13.37.iso (406MB, torrent). • 2016-11-15: Distribution Release: Salix 14.2 "Live Xfce"
• 2016-08-29: Distribution Release: Salix 14.2 "Xfce"
• 2016-06-15: Development Release: Salix 14.2 Beta 1 "Xfce"
• 2014-11-04: Distribution Release: Salix 14.1 "Live Xfce"
• 2014-09-22: Distribution Release: Salix 14.1 "Fluxbox"
2016-11-15 Distribution Release: Salix 14.2 "Live Xfce"
George Vlahavas has announced the release of Salix 14.2 "Live Xfce" edition, a live distribution based on Slackware Linux 14.2 and featuring the Xfce desktop environment: "After a long round of testing, Salix Live Xfce 14.2 is released. This is the first Live release for the 14.2 series and is available for both 32-bit and 64-bit architectures. The live environment uses our own Salix Live Scripts, which has been forked and improved from the original Slackware Live Scripts. 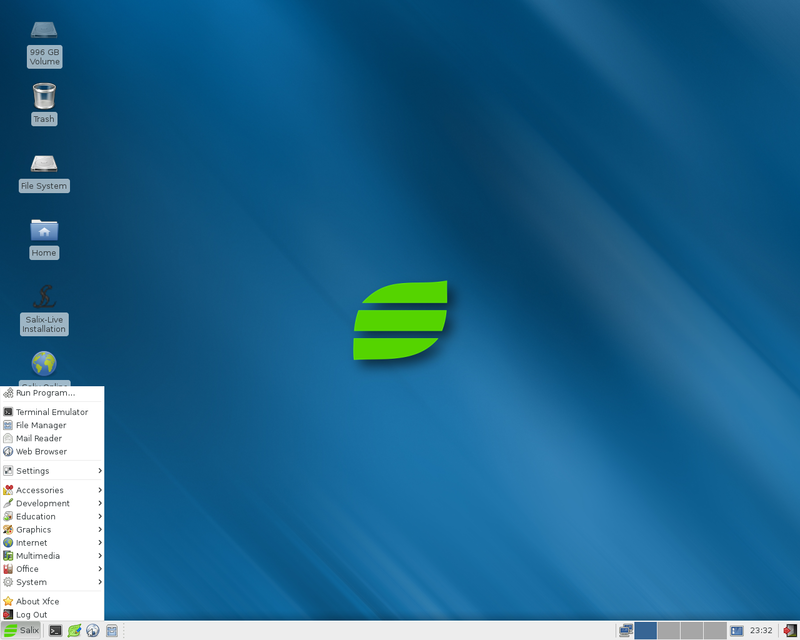 In terms of included software, this live release mirrors the standard Salix Xfce 14.2 release. All software that is included there, like the Xfce 4.12 desktop, Mozilla Firefox, the LibreOffice suite, the collection of Salix System Tools etc, are also included in this release. Some additional software, specific to the Live edition is also included. That includes the Salix Live Installer, which has been updated for this release and allows the user to install Salix Live to the system's hard drive." Read the rest of the release announcement for more information. Download (MD5) from SourceForge: salixlive64-xfce-14.2.iso (1,012MB, torrent). 2016-08-29 Distribution Release: Salix 14.2 "Xfce"
George Vlahavas has announced the release of Salix 14.2 "Xfce". The new version of Salix, a Slackware-based desktop distribution, improves the boot process, provides better language support at install time and includes a few new graphical configuration tools. "We also have two new GUI system tools, both developed in-house. The first one, GUEFI, is a graphical boot manager for UEFI systems and therefore is only available on 64-bit installations using UEFI. You can use it to create/delete/edit/rearrange UEFI boot entries and I don't think there is any other distribution out there with anything similar. Then, we have gtkreposetup, which is the GTK+ counterpart to the console reposetup tool, and which you can use to select your preferred repository mirror. With respect to other software included in this release, Xfce has been upgraded to 4.12. The main browser has been changed back to Firefox. The Firefox package now also includes langpacks for the most popular languages too, so it will most probably also be presented in your native language without having to install anything extra. Additional details on Salix 14.2 can be found in the project's release notes. New screen shots are available on the Salix website. Download (MD5): salix64-xfce-14.2.iso (1,014MB, torrent, pkglist). George Vlahavas has announced the availability of a new development snapshot of Salix, a Slackware-based distribution. The new development release, Salix 14.2 RC 1, features improved localization support and a graphical boot manager for UEFI-enabled systems. The auto-install option has been removed from the system installer as it appears to be largely unused. "First of all, we have two new GUI system tools, both developed in-house. The first one, GUEFI, is a graphical boot manager for UEFI systems and therefore is only available on 64-bit installations using UEFI. You can use it to create/delete/edit/rearrange UEFI boot entries and I don't think there is any other distribution out there with anything similar. Then, we have gtkreposetup, which is the GTK+ counterpart to the console reposetup tool, and which you can use to select your preferred repository mirror. The installer has been fully localized to several languages, so this release can be installed using the installer in English (both US and GB), Dutch, German, Greek, Italian, Spanish (both Spain and Costa-Rica), Swedish and Ukrainian." The release announcement has further details. Download (MD5): salix64-xfce-14.2RC2.iso (913MB, torrent, pkglist). 2016-06-15 Development Release: Salix 14.2 Beta 1 "Xfce"
The Salix project, a desktop oriented distribution based on Slackware, has released a new development snapshot. The new testing release, Salix 14.2 Beta 1 "Xfce", features an update to the distribution's boot process and includes a number of software changes: "The menus that the images boot to are provided by syslinux on systems equipped with BIOS. On UEFI systems, the 64-bit ISO now boots using eLILO, in place of GRUB, and it provides similar menus to syslinux. The 32-bit ISO now includes both the i586 non-PAE and the i686 PAE kernels. You can choose between the two in the boot menu. In terms of software selection, Xfce has been upgraded to 4.12. The main browser has been changed back to Firefox. Also, network configuration is now handled by NetworkManager. PulseAudio is now controlling the audio output by default, which should help a lot with Bluetooth speakers, HDMI audio etc. Other than that it's mostly the same as in previous releases, with LibreOffice, Claws-Mail, GIMP, Parole, Transmission, Viewnior, Zim." Further details can be found in the project's release announcement. Download (MD5): salix64-xfce-14.2beta1.iso (912MB, torrent, pkglist). 2014-11-04 Distribution Release: Salix 14.1 "Live Xfce"
George Vlahavas has announced the release of Salix 14.1 "Live Xfce" edition, a Slackware-based live distribution featuring the Xfce desktop environment: "The Salix Live team is proud to announce the immediate release of Salix Live Xfce 14.1. We haven't had a live release for quite a while, this being our first official live release in more than two years. During the last few months there has been a lot of action behind the scenes to get this ready. The live system creation scripts that we were using up to the 13.37 release (called SaLT), while originally created with the idea to become a one-stop solution for creating our live releases without much trouble, had become a burden to use. After a lot of trying to get them work with newer releases, we decided that we should switch to a better, easier to use system. This is based on the Slackware Live Scripts, which is also what powers other Slackware-based live systems as well." Continue to the release announcement for further details. Download (MD5): salixlive64-xfce-14.1.iso (790MB, torrent). 2014-09-22 Distribution Release: Salix 14.1 "Fluxbox"
George Vlahavas has announced the release of Salix 14.1 "Fluxbox" edition, a lightweight distribution based on Slackware Linux: "Salix Fluxbox is back for 14.1! Our Fluxbox edition is designed to bring a minimalist environment to your desktop. The default desktop layout is comprised only of the Fluxbox panel and the right click menu will bring up the Fluxbox menu, so it should be really light on resources. The file manager that is used is PCManFM. The default browser in this release is Firefox. The office applications that are included are AbiWord and Gnumeric. Whaawmp is the default video player and Exaile is the audio media library application. Of course, Salix Codecs Installer is also there to install all kinds of restricted codecs that you might need. mtPaint is installed as the default picture editor and it fits perfectly with the lightweight feel of the desktop. Other applications included are the usual stuff that goes in Salix releases, like the Transmission torrent client, the Claws-mail email client...." Read the release announcement for additional details. Download (MD5): salix64-fluxbox-14.1.iso (613MB, torrent). 2014-07-27 Distribution Release: Salix 14.1 "Openbox"
George Vlahavas has announced the release of Salix 14.1 "Openbox" edition, a lightweight Slackware-based distribution featuring Openbox as the default window manager: "Salix Openbox 14.1 brings the Openbox window manager, teamed with fbpanel and SpaceFM to create a fast and flexible desktop environment. This is the most lightweight edition we have so far among our 14.1 releases and everything has been tweaked to provide a desktop experience comparable to other Salix editions. The development of this edition involved a long and rigorous period of testing and the final release has evolved a lot since the first beta. This release comes in both 32-bit and 64-bit flavours, with both fitting comfortably within the size of a single CD. The 32-bit flavour is also our first 14.1 release that supports i486, non-PAE capable systems by using the respective kernel, although the default is still the i686 PAE SMP kernel." Here is the full release announcement. Download (MD5): salix64-openbox-14.1.iso (625MB, torrent). 2014-06-01 Distribution Release: Salix 14.1 "MATE"
George Vlahavas has announced the release of Salix 14.1 "MATE" edition, a Slackware-based distribution featuring the MATE 1.8 desktop environment: "Salix MATE is officially back. Our previous MATE release (back in 13.37) came with high praise from a lot of our users, with many considering it as our best release ever. Salix MATE 14.1, built around the latest MATE 1.8 desktop environment comes to follow up with that. The MATE desktop environment brings a familiar and user-friendly approach to the desktop, with sane defaults and a great selection of application bundled with it. Included in this release, alongside the MATE desktop applications like the Caja file manager, the MATE Control Center and all the MATE panel applets and utilities, is the latest Firefox ESR browser, the LibreOffice suite, GIMP, the ClawsMail e-mail client, the Transmission torrent client...." Continue to the release announcement to learn more. Download (MD5): salix64-mate-14.1.iso (754MB, torrent). 2014-03-04 Distribution Release: Salix 14.1 "Xfce"
George Vlahavas has announced the release of Salix 14.1 "Xfce" edition, a Slackware-based distribution featuring the Xfce 4.10 desktop environment: "After a long development period Salix Xfce 14.1 is ready. There have been many and important changes since our last release. One of them is that now the 64-bit installer supports installation on (U)EFI systems. In (U)EFI enabled systems, the 64-bit release should prompt to install ELILO instead of LILO at the end of installation. GPT-partitioned hard drives are also now fully supported by both 32-bit and 64-bit installers. Another very important change is that we switched completely to sudo, abandoning the use of su by default. If you wish to give sudo privileges to any user, you should just make him a member of the wheel group. The first user that is created during the installation process automatically becomes a member of the wheel group and gets sudo privileges. Any other user that is created after that does not enter the wheel group automatically and does not get sudo privileges by default." See the release announcement for further details and links to useful documents. Download (MD5): salix64-xfce-14.1.iso (713MB, torrent).